I was so excited for the past weeks thinking which food shall I start with as the first solid food in his life. I chose Avocado in the end. I personally loved Avocado and that this delicious fruit has to be my precious baby’s first food (chuckles)! 1) Cut the avocado into half, lengthwise. Beware of the large seed inside. Cut around it. Hold each half with two hands, twist in opposite direction to separate the halves. 2) Scope out avocado flesh (choose the inner yellowish part). Put it in a clean baby bowl. 3) Add BM or FM. Mash with baby mashing spoon till it turns into purée. Serve bit by bit to your precious baby. Half avocado counts about 135kcal. Tips: Use room temperature Avocado. * Choose ripe Avocado which has ripen with almost 90% blacken in its outer skin. * If you bought an unripe dark green avocado, leave it outside in the kitchen table for 3 – 4 days. * Adjust the adding of milk to your preferred texture of avocado purée. The more milk you add, the smoother and softer consistency yields. 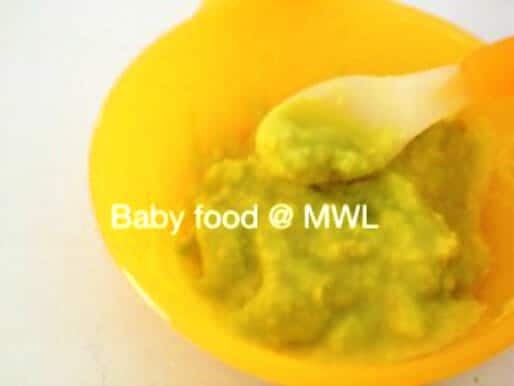 * First day of weaning, try with 2 teaspoons of feeding will do. Add amount of feeding gradually.